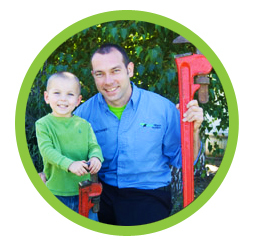 Zachary Mikat, affectionately known as the “Hippo Man” by his children, started Green Hippo Plumbing after over a decade of experience working in the construction industry. He decided to start his own business in order to provide his customers with the highest service and quality workmanship. The unique name of his company stems from both his fun loving personality and his desire to integrate the concept of conservation-minded plumbing into his business. One day while having the lyrics of the old Shirley Temple song, “I Want a Hippopotamus for Christmas” running through his head, he and his wife decided to call the business “Green Hippo”. He has been certified as a Greenplumber by Greenplumbers® USA and is always seeking to expand his knowledge of the field and to bring the best of what they have to offer into his business, which is where the “Green” in the name comes from. The “Hippo” is just pure fun. Zach lives his life both personally and professionally by the standards set forth in God’s Word and his integrity is evident in the way the company is run. He loves his work, and when he or any of his plumbers leave your house, that love for the trade will be evident in the quality of the work that is left behind. At Green Hippo Plumbing, our success is measured by your satisfaction! We at Green Hippo Plumbing commit to providing the highest quality of Customer Service. You can expect us to quote you the price of the job before the work is started, and you can count on seeing that same price on the invoice when it is presented to you. We don’t like hidden expenses and we know that you don’t either.